I looked over this story, and immediately realized that there was just something biblical about it. Proverbs 17:24 “Wisdom is in the presence of the one who has understanding, But the eyes of a fool are on the ends of the earth.” Which is to say, the prudent man keeps the word of God continually in view. But the foolish man cannot fix his thoughts, nor pursue any purpose with steadiness. Proverbs 27:22 Though you pound a fool in a mortar with a pestle along with crushed grain, Yet his folly will not depart from him. CHARLOTTE – Even by President Obama’s loquacious standards, an answer he gave here on health care Friday was a doozy. Toward the end of a question-and-answer session with workers at an advanced battery technology manufacturer, a woman named Doris stood to ask the president whether it was a “wise decision to add more taxes to us with the health care” package. “We are over-taxed as it is,” Doris said bluntly. Obama started out feisty. “Well, let’s talk about that, because this is an area where there’s been just a whole lot of misinformation, and I’m going to have to work hard over the next several months to clean up a lot of the misapprehensions that people have,” the president said. He then spent the next 17 minutes and 12 seconds lulling the crowd into a daze. His discursive answer – more than 2,500 words long — wandered from topic to topic, including commentary on the deficit, pay-as-you-go rules passed by Congress, Congressional Budget Office reports on Medicare waste, COBRA coverage, the Recovery Act and Federal Medical Assistance Percentages (he referred to this last item by its inside-the-Beltway name, “F-Map”). He talked about the notion of eliminating foreign aid (not worth it, he said). He invoked Warren Buffett, earmarks and the payroll tax that funds Medicare (referring to it, in fluent Washington lingo, as “FICA”). Always fond of lists, Obama ticked off his approach to health care — twice. “Number one is that we are the only — we have been, up until last week, the only advanced country that allows 50 million of its citizens to not have any health insurance,” he said. A few minutes later he got to the next point, which seemed awfully similar to the first. “Number two, you don’t know who might end up being in that situation,” he said, then carried on explaining further still. “Point number three is that the way insurance companies have been operating, even if you’ve got health insurance you don’t always know what you got, because what has been increasingly the practice is that if you’re not lucky enough to work for a big company that is a big pool, that essentially is almost a self-insurer, then what’s happening is, is you’re going out on the marketplace, you may be buying insurance, you think you’re covered, but then when you get sick they decide to drop the insurance right when you need it,” Obama continued, winding on with the answer. [That entire droning paragraph full of drivel is ONE sentence, btw]. Halfway through, an audience member on the riser yawned. But Obama wasn’t finished. He had a “final point,” before starting again with another list — of three points. “What we said is, number one, we’ll have the basic principle that everybody gets coverage,” he said, before launching into the next two points, for a grand total of seven. His wandering approach might not matter if Obama weren’t being billed as the chief salesman of the health-care overhaul. Public opinion on the bill remains divided, and Democratic officials are planning to send Obama into the country to persuade wary citizens that it will work for them in the long run. It was not evident that he changed any minds at Friday’s event. The audience sat politely, but people in the back of the room began to wander off. [People in the front of the room were cursing over the tragic fact that they were sitting in the front of the room]. 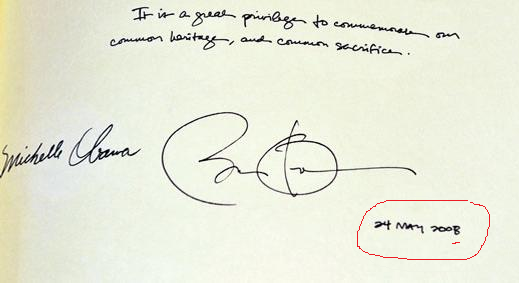 Even Obama seemed to recognize that he had gone on too long. He apologized — in keeping with the spirit of the moment, not once, but twice. “Boy, that was a long answer. I’m sorry,” he said, drawing nervous laughter that sounded somewhat like relief as he wrapped up. And, of course, I’m sure he didn’t. For what it’s worth, do you remember how Brett Baier was attacked by the left for interrupting Obama during their interview on Fox News? That 17 minute answer ought to more than tell you why. I actually quit watching Obama during the campaign. This man who is billed as the greatest orator who ever lived has a habit of droning on and on without actually saying anything. He hedges his phrases with so many caveats and exceptions that he never actually seems to come to a meaningful conclusion. And that’s the primary reason that most people still don’t know who the hell he is or what the hell he truly stands for going on three full years after he started talking to the nation. 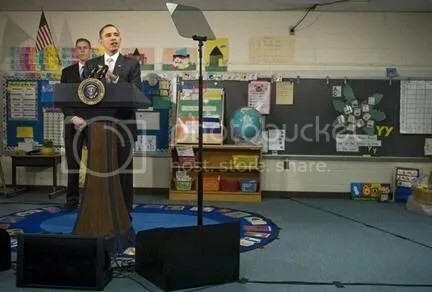 I heard Obama say one thing, and then later say a different thing, while saying, “As I’ve been saying,” too many times. If I want to know what Obama said, I look for a transcript. He’s reading practically everything he says off a teleprompter; why shouldn’t I read it as well? The American mainstream media may swoon over Obama (or at least get shivers running up their legs), but Solomon, the wisest man who ever lived, would have seen right through him. Update: Here’s an article entitled, “Obama’s 17 minutes of hate,” which supplies a few corrections to Obama’s blathering rhetoric. Obama Mouthpiece Robert Gibbs mocked Sarah Palin for the five words she’d written on her palm, as did numerous mainline media propagandists such as MSNBC’s Andrea Mitchell. It is frankly amazing that the media went so nuts over Sarah Palin’s palm. It’s like a dog and pony show, with all the media dogs and ponies prancing around whenever Sarah Palin says or does anything. One interesting theory about the “palmgate” is that Sarah Palin is deliberately messing with the mainstream media’s minds, having every bit as little respect for them as they for her. The only difference is that she keeps winning the game, and keep losing it. Ordinary people who didn’t have an ideological axe to grind would probably find it difficult to understand how the people who are marching lockstep behind a man who literally has to bring his teleprompter into sixth grade classrooms could see a “gotcha!” moment in five words scrawled on a palm. But let’s get past that obvious comparison and go straight apples-to-apples. Sarah Palin wrote five words on her hand for a speech; there were no rules barring her from doing so. In Dianne Feinstein’s case, she broke the rules and the etiquette of a debate. She took an unfair advantage against her opponent. She cheated. Which makes her a Democrat in good standing. Since Democrats argued that Sarah Palin was so stupid for writing on her palm, I propose that we administer an IQ test to Dianne Feinstein and to every single Democrat in office, and every Democrat who tests the same as or lower than Feinstein resign from office for being “f-ing retarded” (to quote Obama’s chief of staff Rahm Emanuel). You find it again and again: hypocrisy defines liberals. It is their core essence. There’s a saying that when you point at someone, three fingers are pointing back at you. That pretty much sums up what happens when the left attacks Sarah Palin. Remember those quizzes you had on the state capitals back in junior high? Oh, the pressure! The temptation to write “Pierre, Olympia, Dover, Albany” on the inside of your hand was overwhelming, wasn’t it? But you resisted. Maybe Sarah Palin should have done the same. The former vice presidential candidate seems to have been caught using curious crib notes during an interview this past weekend at the high-profile Tea Party Convention in Nashville. While speaking about her top political priorities, Ms. Palin gazed at her hand in a rather suspicious manner. Later, Web researchers zoomed in on her left palm and found the following words scrawled in black ink: “Energy, Budget cuts (with “budget” crossed out), Tax, Lift American Spirits.” In an ironic twist during the speech, Ms. Palin worked in a jab against President Obama’s often-mocked use of TelePrompTers. You can watch the clip below or check out a close-up here. Following the flap, the Web went wild. Andrea Mitchell of MSNBC mocked Ms. Palin by relying on her own crib notes to recap highlights from Palin’s appearance. Her keynote speech, it should be noted, had the crowd on its feet. “Run, Sarah, run,” the crowd chanted (as in “please run for president in 2012”). But palm-gate wasn’t the only bit of news sparked by Palin. Her defense of Rush Limbaugh’s use of the word “retards” raised eyebrows, as well. On Fox News Sunday, the anti “r-word” crusader contended that Limbaugh had used the word in the context of political humor and satire. Earlier in the week, the difference between her angry reaction to White House Chief of Staff Rahm Emanuel’s use of the “slur” and a more restrained response to Limbaugh’s made from some awkward fallout. Web searches on “sarah palin on fox news” and “palin limbaugh” have both surged as the controversy swirled. Let’s start with Rahm Emanuel, Rush Limbaugh, and the expression “f-ing retarded.” The mainstream liberal media is every bit as brain dead idiot stupid as Rahm Emanuel said as the ranks of the liberal activists that today’s journalists are largely drawn from. Otherwise they would understand that Rush Limbaugh used the phrase the day after the Emanuel usage came out to derisively direct attention to what Obama’s chief of staff had said. They couldn’t be more profoundly stupid to think that Rush Limbaugh just happened to use the same phrase – all the while repeatedly invoking Rahm Emanuel’s name – on his own to express the same sort of bias Emanuel had exhibited. The mainstream media are not merely partisan ideological propagandists; they are dumbass partisan ideological propagandists. By this idiotic logic, we should arrest all the female police officers who pose as prostitutes to bust johns for prostitution. And it’s this unbelievable stupidity that made Rush essentially say, “Maybe Rahm Emanuel was right in using the phrase to refer to leftists.” Because if ANYBODY is “f-ing retarded,” it is the left. And for all the derision of being as dumb as a box of rocks, Sarah Palin demonstrates again that she is still smarter than every single member of the mainstream media combined. Because she understands the difference between Rahm Emanuel using a disparaging term to mock the diminished intellects of the far left, and Rush Limbaugh’s using the same term to mock Rahm Emanuel and the galling self-righteous hypocrisy of the left. And now let us regard the 4 words/phrases that Sarah Palin wrote on her palm. 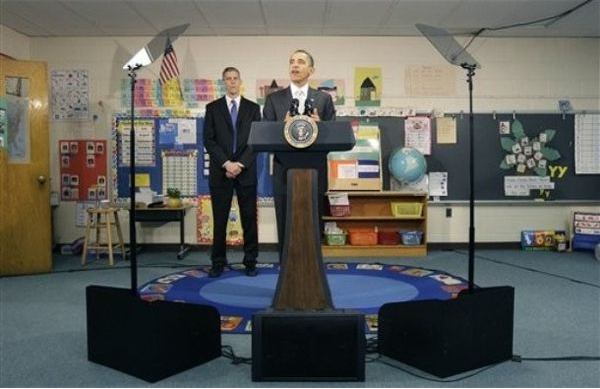 – that he is forced to bring his teleprompters with him WHEREVER he goes lest he sounds like, well, what Rahm Emanuel said. Sarah Palin had a couple of words on her palm to help her remember a few ideas she wanted to make sure she covered. Barack Obama has to have every single word scripted to ensure he doesn’t drool while he babbles incoherently. So you go ahead and mock Sarah Palin for having a few words on her palm, liberals. Just realize that you are implicitly acknowledging that your Obama Messiah is 50,000 times more stupid than Sarah Palin is by the very standard you are attacking her over. 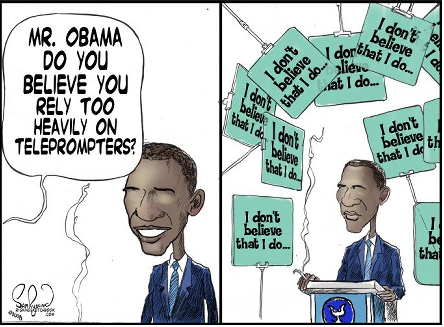 Like the emperor’s new clothes, Obama’s speeches count on people determining that if they don’t see the wisdom coming out of Obama’s mouth, they’re fools. When, of course, it’s only fools who think that way to begin with. Ted Widmer, who edited an anthology of political speeches for the Library of America, praised Obama for his “masterful” style, but could not cite a specific line the president said. Similar observations were made by Jeff Shesol, David Frum and Harry C. McPherson, who wrote speeches for presidents Bill Clinton, George W. Bush and Lyndon Johnson, respectively. A distinctive phrase can define, or make history, like Franklin Roosevelt’s calling Dec. 7, 1941, “a date that will live in infamy” because of the bombing of Pearl Harbor, or President Ford’s declaration, upon taking office after Richard Nixon had resigned, that “our long national nightmare” was over. President Kennedy’s inaugural call to “ask what you can do for your country” helped inspire an era of public service, while President Reagan’s demand that Soviet leader Mikhail Gorbachev “tear down that wall,” the Berlin Wall, was a climactic moment of the Cold War. Frum and others warn that a speechwriter can be so eager to come up with a memorable quote that the overall text suffers. Obama’s preference for sustain explanation over snappy summaries is a good thing, Widmer says, because it means he’s treating the public as adults. Geoffrey O’Brien, editor of the next edition of Bartlett’s Familiar Quotations, says that so far he has 12 Obama citings planned, but just one since he became president (though he says that could well change). 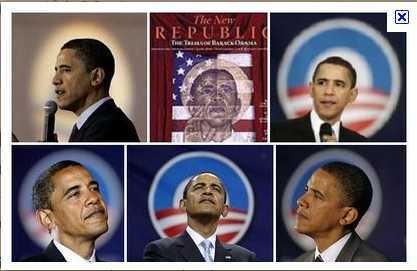 The passage he wants to include from Obama’s presidency comes from his inaugural speech, when Obama called the United States “a nation of Christians and Muslims, Jews and Hindus, and nonbelievers.” He could not immediately cite any other lines from Obama’s presidential speeches. O’Brien says that when he talks about Obama with young people the phrase they remember is “Yes, We Can,” his campaign slogan. The stature of Kennedy’s speech is one reason it hasn’t been matched. Shesol recalls an agreement among Clinton speechwriters that reversible raincoats should be avoided because Kennedy and Sorensen had so perfected them. The opening three paragraphs from this AP article assume the liberal thesis that if the man who has bored us with more speeches and appearances only explained himself, the country would be thrilled with his uber-lib big-government policies. My very favorite line from the article is Sorenson’s thesis: that “some of the speeches are too complicated for typical citizens and very clear to university faculties and big newspaper editorial boards.” Which is the emperor’s new clothes, part deux. If you were really really smart like we liberal elites, you’d understand the masterful wisdom that is The Obama. Obama’s speechwriter (hey, Obama doesn’t write his own speeches after all, Ted!) Adam Frankel talks about “the trust [Obama] puts in people to understand a complicated argument.” So if you don’t think what Obama’s saying makes any sense, you can know in advance that it’s because you’re ignorant. When Obama speaks, you’d better not see the emperor’s underwear, or you’re stupid. I’ll tell you a little secret: it’s because Obama takes way too long to say nothing. Obama is all “masterful style” and absolutely no substance. And these postmodernists who themselves believe in nothing beyond the most surface of appearances end up falling for nothing every single time as long as that nothing is eloquently painted with polished rhetoric. In The Emperor’s New Clothes, the overwhelming majority are suckered by a couple of opportunists to willingly participate in a shocking display of collective ignorance despite what should be obvious to any with common sense. “There is nothing new under the sun,” wise Solomon once said. And so we are right back to the vain emperor and his vain illusion that reveals the pretentiousness, pomposity, social hypocrisy, collective denial, and hollow ostentatiousness of our own time.